Die casting is a process of metal casting that forces molten metal under high pressure into a specifically designed, reusable mold called a die. The mold cavity is created using two hardened tooled steel dies which have been machined into shape. Most die castings are made from non-ferrous metals, such as zinc, aluminium or magnesium based alloys, which are melted and then injected into the dies. Depending on the type of metal being cast, a hot chamber machine (for low melting temperature alloys like zinc) or cold chamber machine (for high melting temperature alloys like aluminum) is used. The the molten metal is injected into the dies, and it rapidly cools and solidifies into the final part which is called the casting. 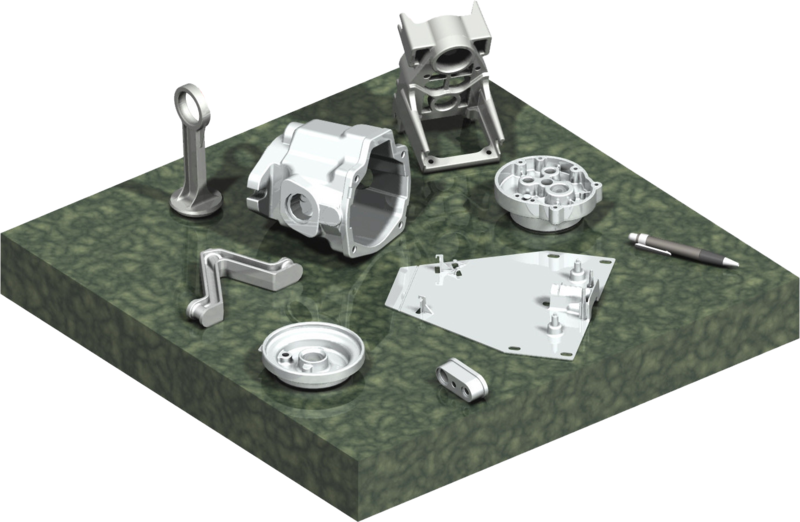 R&S Design will work with you to complete your part design so it’s completely optimized for die cast production. 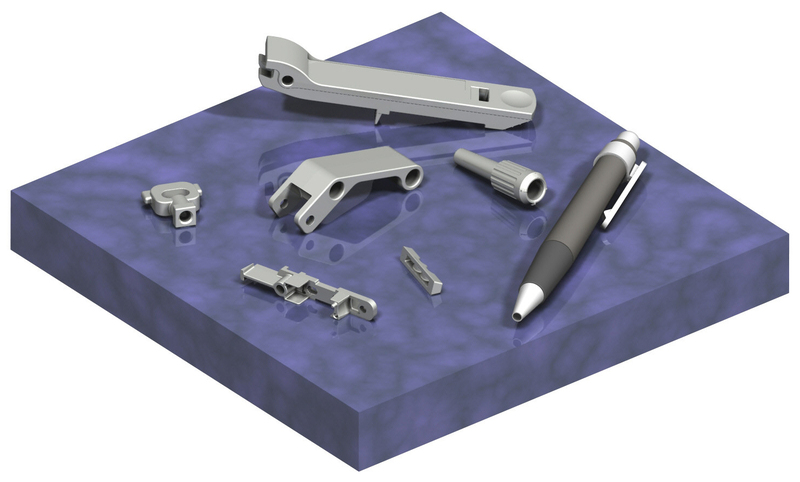 The customer’s product design requirements directly affect the size, type, features and cost of the required tooling. 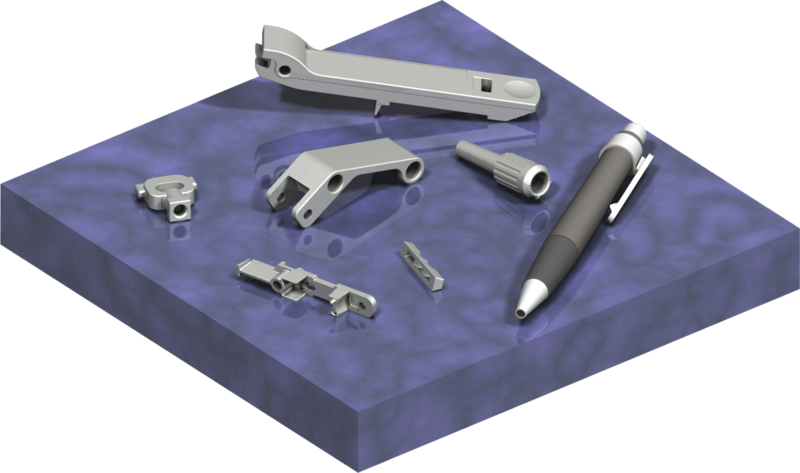 We can design your part in Aluminum, Magnesium, Zinc, or a special die casting alloy of your choosing. Our years of specialized experience in custom tooling means you will end up with a better finished product. 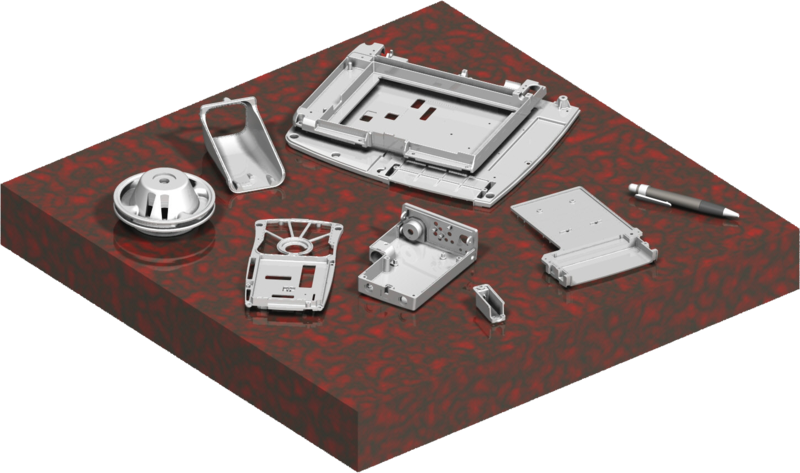 We are experts in the selection of the proper material for die casting, how it can affect the part design, how it will impact the machine and tooling, and how the material chosen will effect the life of the dies. One of the most important first steps when designing a die component is choosing the right alloy to use. The most widely chosen are aluminum, magnesium and zinc. They have many differing characteristics and properties that should be evaluated before you make a selection. R&S Design will utilize our knowledge and years of experience with different alloys and work with you and pick the best and most cost effective material for your entire project. 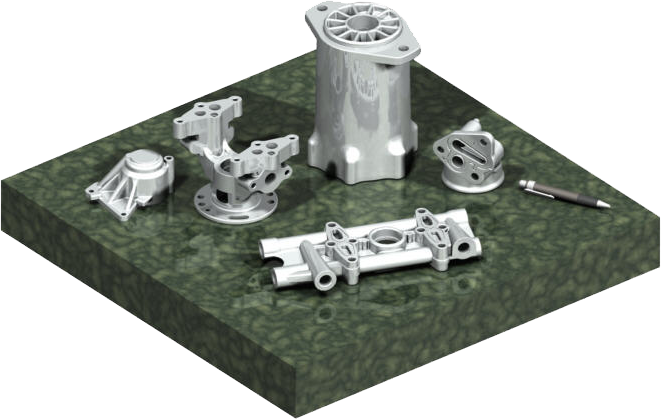 Choosing the correct die material can make or break the success of your castings. If you use the wrong alloy, you can face delays, down-time, revisions and costly replacements. 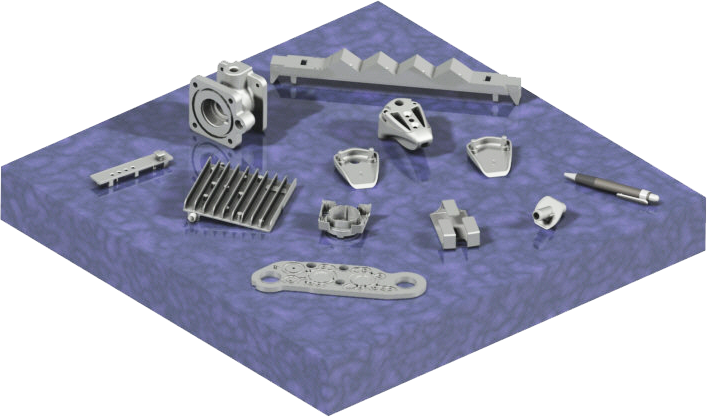 These are some of the key factors to evaluate when selecting the alloy for your die project: Dimensional stability, Corrosion resistance, Casting ease, Part complexity, Dimensional accuracy, Die cost, Machining cost, Finishing cost and Tool production levels and replacement costs. 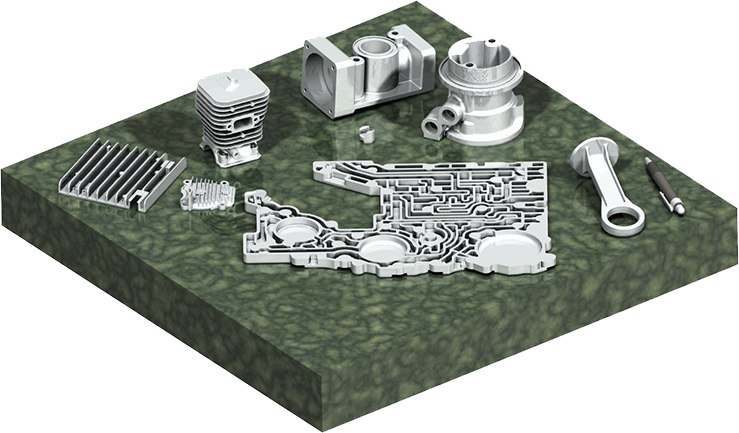 These images are samples of aluminum die castings developed by R&S Design from 2-d prints. R&S also designed the molds to produce the castings. With over 30 years experience, we have the knowledge and network to take your project from Start to Finish. 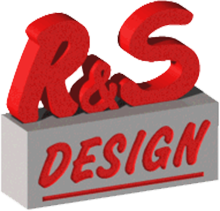 R & S Design has assisted companies across many different industries with their die casting needs for over 30 years. Our experience and dedication to our craft make us second to none. We would be happy to work with you on any new die casting projects, part testing or part modifications you may need.